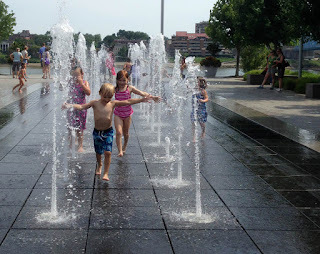 Smale Riverfront Park is quickly becoming a favorite new playground for Cincinnati's children. Along with gardens, bike paths and river views, the many ingeniously designed playgrounds are keeping them happy and active. On a hot day, the water features are the most popular. We watched children run, splash, dance, and hop in and out of an allee of bubbling fountains right near the Reds baseball park. It's been a long time since kids had a reason to look forward to spending the day downtown, but now they will be begging to do so.